Around a year ago in this column, I underlined the troubles that BHS were experiencing. As the embattled retailer has recently announced significant job losses, it is a suitable time to explore consumer perception of the brand, and what this means for the longer term prosperity of an old high-street favourite. But how did it come to this? YouGov BrandIndex points to two issues the company faces – one is down to the demographics of its consumers, the other to how its competitors have coped better with the changing retail landscape. Most of BHS’ customers are women. Looking at female consumers’ Purchase Intent scores for the year to 1 March 2015 and the year to March 2016, two things are apparent. The first is how small BHS’ audience is. It is around a third that of Primark and Debenhams – two of its biggest rivals. The second is the growth of Primark – it is rampaging through the sector. Debenhams is insulated to an extent by its relatively large market share, but it is hard enough for BHS to maintain its low scores, let alone make inroads against its competitors. 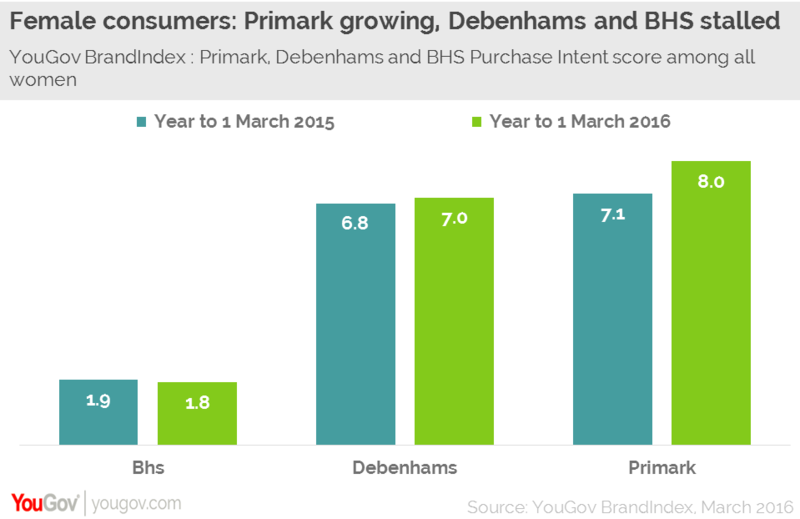 However, these Purchase Intent scores include all women, including those under 35 – Primark’s prime audience – so we might expect BHS to struggle. Yet the retailer does not fare any better when we look at its key demographic – women aged over 35. It is clear from these scores how bad the situation is for BHS as it has lost ground among the group that it has been trying hardest to court. 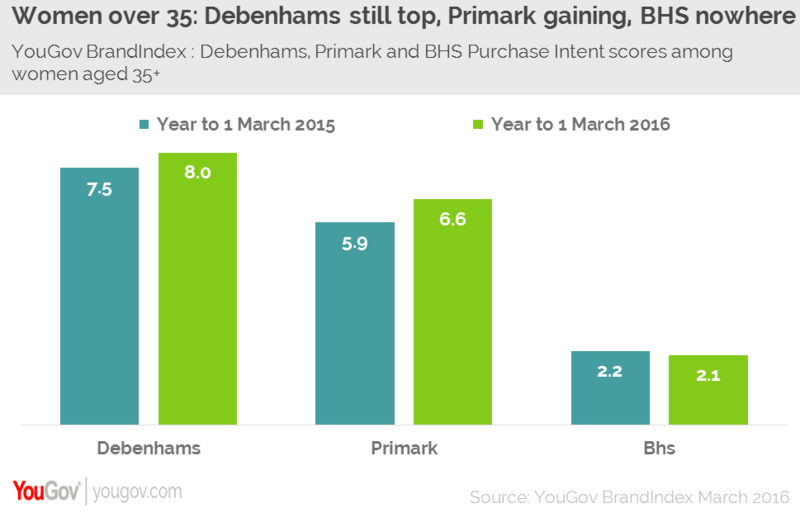 Debenhams, by comparison, has managed to show some improvement in the past year, further calling into question BHS’ future. While BHS is struggling to keep its head above water, Primark is making gains – attracting the older consumers that formed the bedrock of BHS customer base. If BHS were to leave the high street the question is where its customers will go – to a surging Primark or the established Debenhams? Given what has happened to BHS, other retailers need to be mindful of their future strategies.